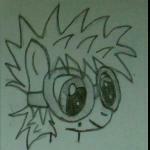 Ok, so I was bored earlier and so I allowed the MLP infection to run through my head some more. 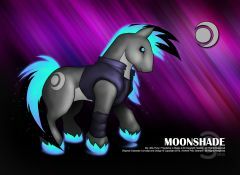 I decided to take my half-worgen character as a base and created a new stallion named Moonshade. Since he's an earth pony, I figured I needed to come up with a good reason for his mane, tail, eyes and hooves to glow so I decided that he actually lives in an area dominated by caves and likes to eat the phosphorescent mushrooms in the caves... so much that it has permanently caused him to glow on his own. No, I haven't submitted him for role play yet... so hopefully no one has taken that name. If so, I'll be embarassed and have to find something else to call him. © Copyright 2013, Andrew Graham. All Rights Reserved.